Now that Adaline is almost 4 months old and we've gotten into a nice routine with 3, I've been able to spend more time cooking, baking and trying new recipes. Being in the kitchen has always been something I really enjoy and that gives me life. It's one of those things I do for "me" and I know I'm a better Mom to my girls when I am filled up; I have more to pour out to them. One of my favorite cookbooks, Against All Grain, has been my go-to lately when it comes to trying new recipes. 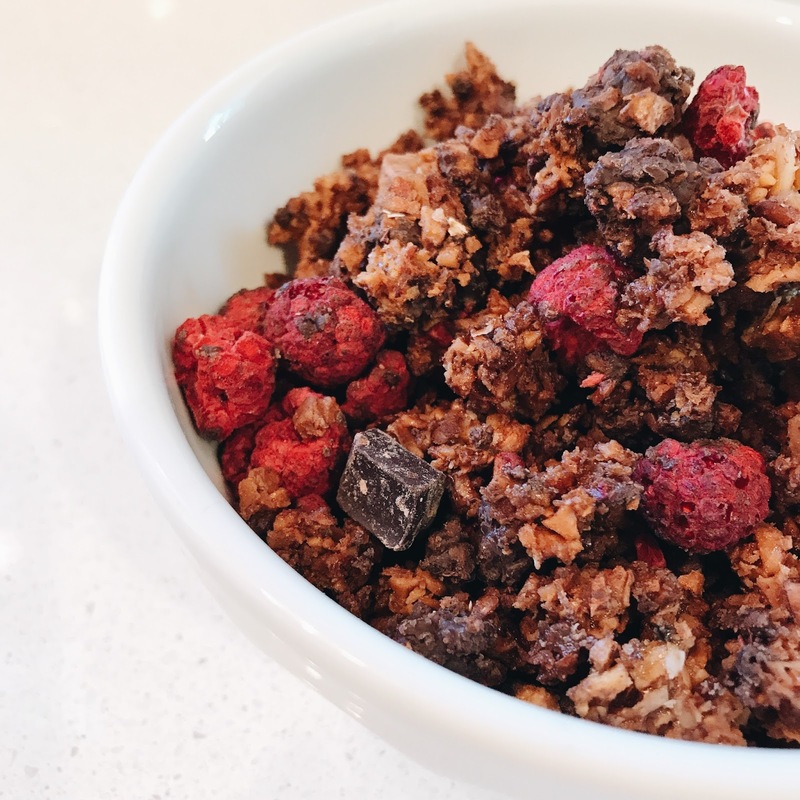 Last week I made a version of Danielle's grain-free paleo granola and it was such a hit I have plans to make it again soon. So many of you asked for the recipe when I shared a peek on my instastories @blessednestblog, so I thought I'd post it here! This recipe can easily be modified with your favorite freeze-dried fruit and while it's a little bit of work up front, it's well-worth it for how delicious it is. It's completely grain-free but you'd never know it. We love it on top of unsweetened coconut yogurt, in a bowl with almond milk or just as a snack by the spoonful. The original recipe calls for strawberries but raspberries & dark chocolate is one of my favorite combinations, so I went for that instead. 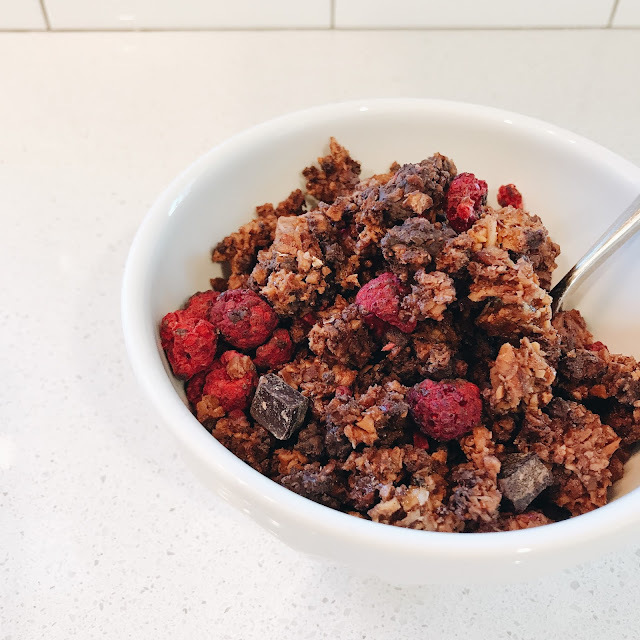 It also says to let the granola cool completely before mixing in the dark chocolate chunks, but I wanted it to melt and almost coat the granola, so I did it shortly after I removed the trays from the oven and used closer to 1/2 cup versus 1/4. Enjoy! Olivia finished her first year of preschool last week and now that summer is here, we are always striving to get outside and enjoy the weather and time as a family. Some days that is easier than others and this May has been incredibly rainy compared to years past. Most mornings we wake up, I shower, make and eat breakfast with the girls, the girls take baths and then we head out the door for a playdate, errands or an appointment. Afternoons are usually spent outside just playing and relaxing, whether before lunch or afterward before naps. After the girls wake up from their naps, I feel like we are always searching for activities to keep them occupied. They usually nap from about 2-4:30pm and there are those 1-2 hours before dinner where they seem to basically be asking for snacks or to watch TV. Being that we try to limit both the snacking and screen time, I have been trying to plan fun little activities that get us out of the house and out of our routine a few days a week. Even if it just means going to Nana's and having a picnic in her yard, filling the gas tank & getting a carwash with them along for the ride or reading books in the sunshine, it feels good to give them something to look forward to when they wake up that's different and exciting. 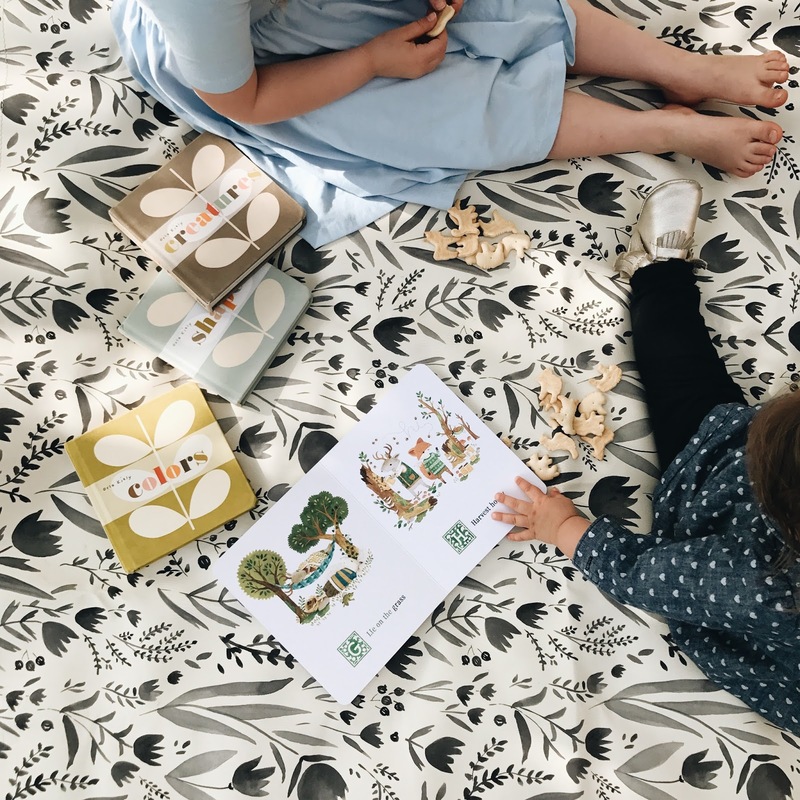 The girls love books probably more than any other activity, and sticker books are a close second. They will literally sit on our couch for two hours straight doing their favorite sticker book (here). 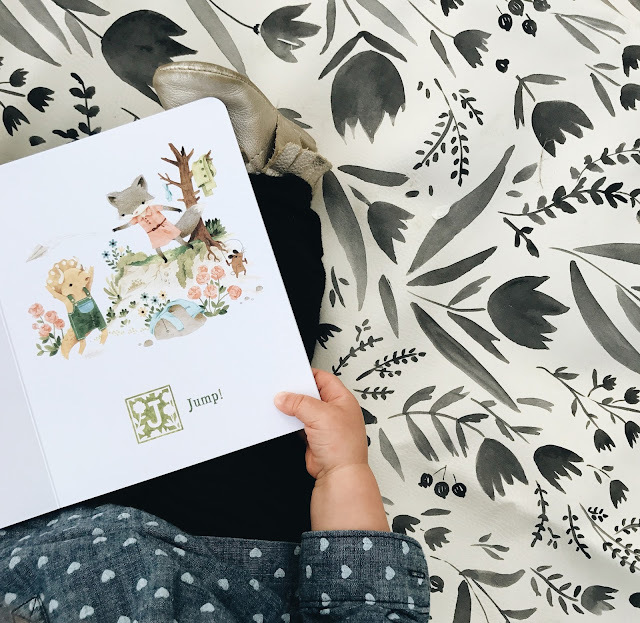 Olivia actually does each page and Poppy mostly just stacks stickers on top of each other and onto everything around her, but it keeps them occupied and having fun, plus pretty hilarious to hear Poppy say, "sticker book peas Mama" with a big smile. Olivia has been loving doing wipe clean preschool workbooks as well, as she is learning to write the alphabet, her name and spell words. Her favorites are this one and this one. For books, you can find all our favorites in this A-Z post here, but lately we've been loving the new board book version of Adventures with Barefoot Critters (above), The House in the Night, Each Peach Pear Plum, the Orla Kiely board books and Fairy Friends board books. We also love going to local ponds to feed ducks & geese, taking walks around our neighborhood, park hopping, having "snack picnics" where we pack a handful of healthy snacks (a few favorite are blueberries and blackberries, bare cinnamon apple chips, pistachios, string cheese and sometimes popsicles) and just camp out somewhere nice and enjoy the warm weather. 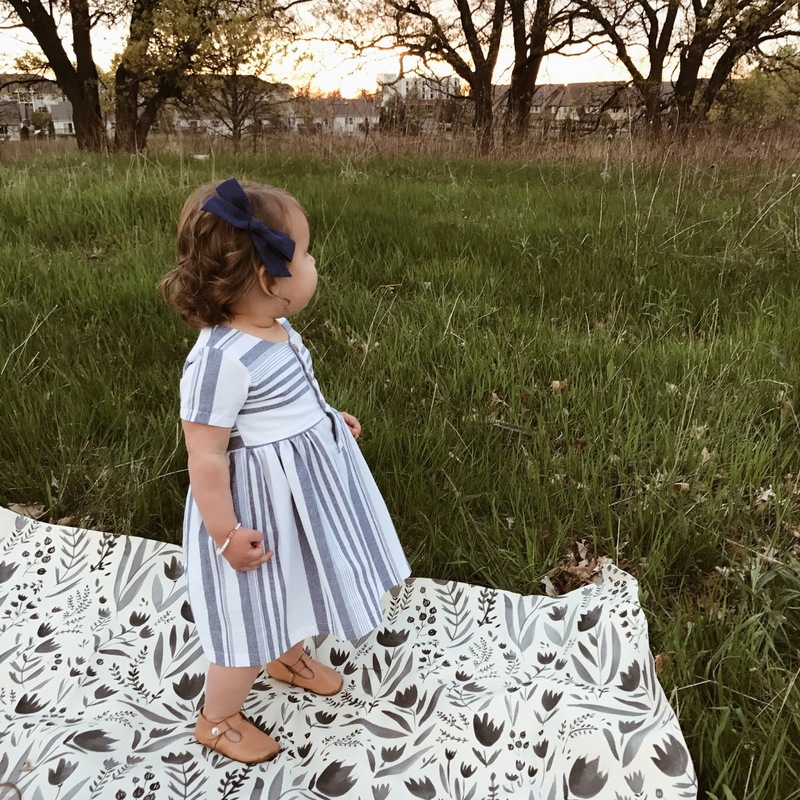 We always bring along our gathre mats for a comfy place to sit; we love these because they wipe clean and are perfect for both indoor and outdoor activities. We also love laying in the hammock, doing bubbles or sidewalk chalk (another great way for Olivia to practice her letters) or running a fun errand like the carwash or to the book store. Some afternoons we bake, have tea parties or do puzzles and water wow pads in the backyard (the girls love these, they're great for the car too). We have a bunch of bird feeders in our backyard so once a week I will refill the feeders with the girls' help. We just recently added a new window feeder to our collection so the girls love standing by the window and watching the birds just a few inches from them. They love learning the names of birds and calling out the colors they see on each one. I grew up birdwatching with my Dad; he basically knows everything about every backyard bird ever to exist, and with just a few random descriptors he can identify them in seconds. Birdwatching is a hobby I love so much so it's fun to raise my girls instilling that same interest in them. And to see birds up close and all their little features really makes you appreciate God and the splendor of His creation. Another popular activity for summertime is anything + everything water-related. My parents have a pool which we take full advantage of during the summer but it's not something I'm able to take all 3 girls to unless I have Dustin along because I need to basically be in 3 places at once and when water is involved, that is a challenge. We had a blow up pool last summer in the backyard which was fun, but then killed all the grass underneath it so at the end of the summer I threw it out. Ha. I'm on the hunt for a nice water table because I know the girls would love that, but every one I see is so full of plastic and bright colors, so if you have any recommendations of one you love that is a bit nicer to look at, I'd love to hear them! We also love playing in the sprinkler with the girls especially on super hot days and this sprinkler attachment makes it extra fun. 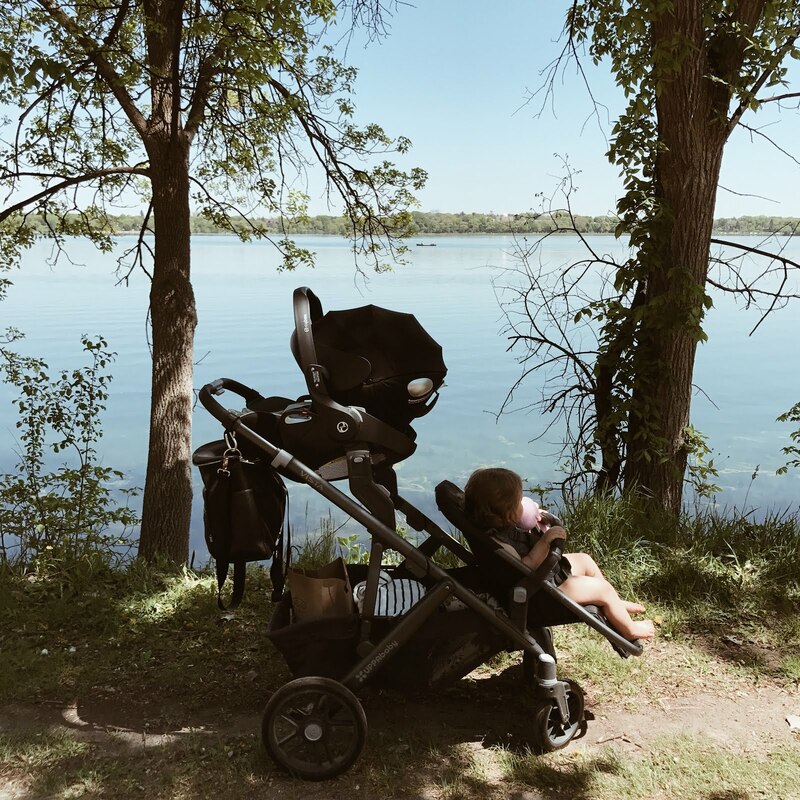 Now that Summer is here, we are trying to spend as much time outside as possible and its always nice to switch up our routine. I'm pretty sure the girls would be content doing the same thing day after day, but Dustin and I love taking them new places and making new memories, even if it's just down the street to sit in the grass, eat animal crackers and read their favorite books. 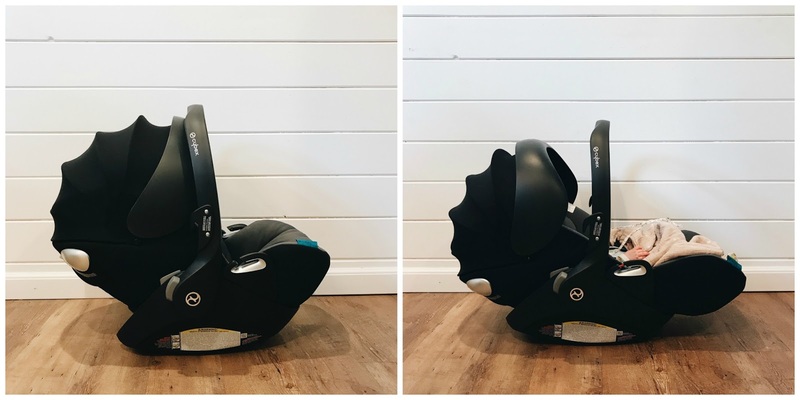 Last summer at this time we were starting to renovate our kitchen -- a major task -- and a week after we began demo we found out we were pregnant with Baby #3. It was a long, hot summer for all of us and I am so grateful to be on the other side of things this summer, not only with my kitchen complete but with all 3 of my girls here with me. 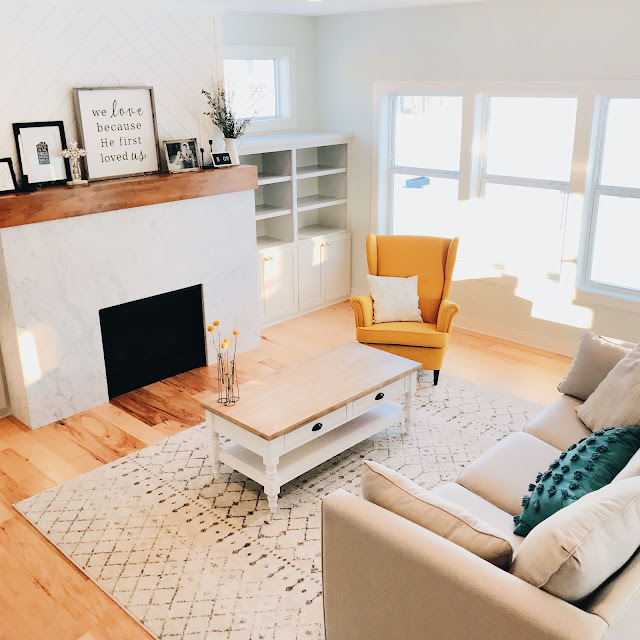 Each month on the blog I share a few of the items we have been loving lately in our home and family in my Love List series, so here it goes for May! 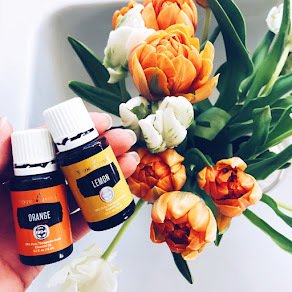 one || I love sharing the products we use in our home and with our girls, especially when it comes to our favorite bath, hair and skin products because there are so many on the market it can be overwhelming to find one you love that also works well and is safe for your whole family. 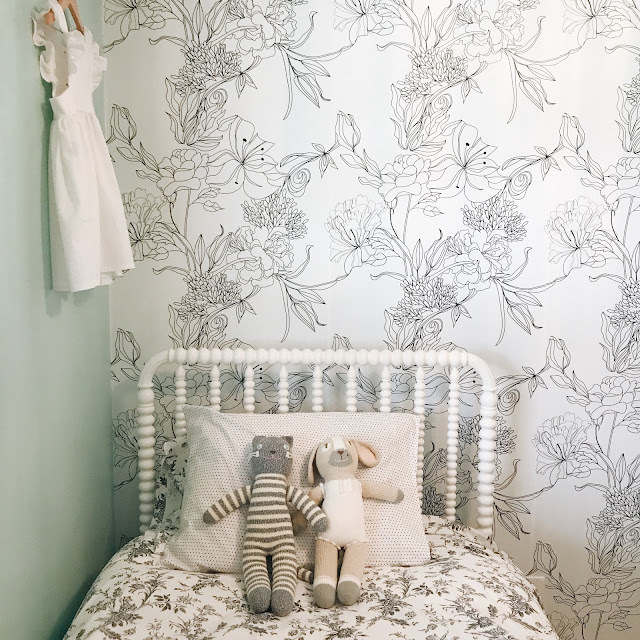 One of our favorite brands for that is Wash With Water, an organic line of skincare for newborns on up to big kids -- offering everything from body wash to lotions to shampoo, bubble bath and more. They have a newer big kid line which we started using this Spring with Olivia and Penelope and have been loving. 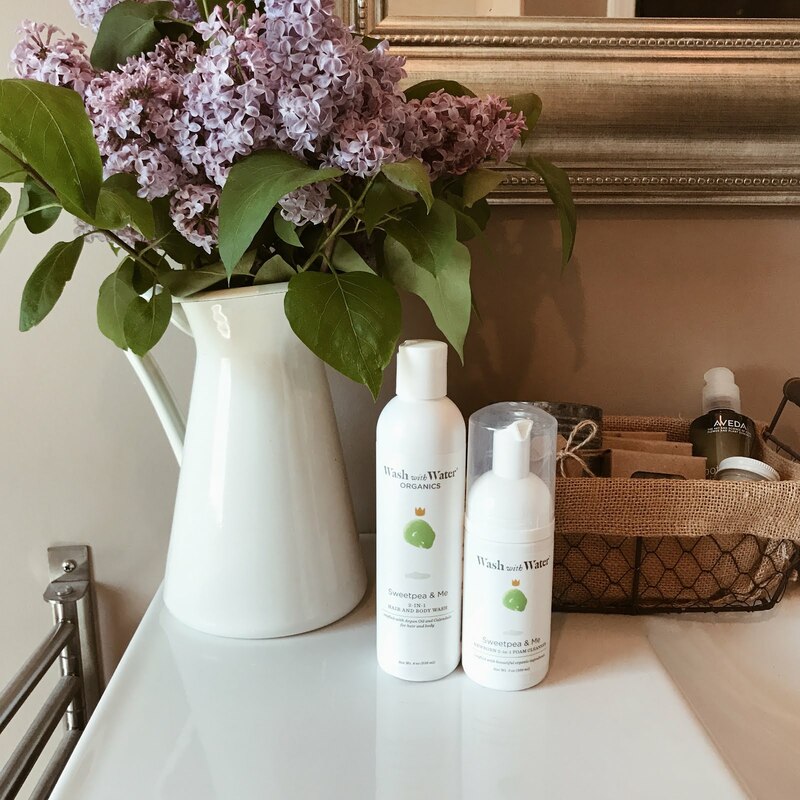 My favorite products from Wash With Water to use on Adaline are their foaming newborn cleanser (which I got hooked on when Penelope was born in 2015), their classic baby shampoo and body wash and their Kissable Skin Lotion. You can get the newborn foaming cleanser in an unscented version and then we also love their Sweetpea & Me scented shampoo and body wash, which I of course had to try when Poppy was born because we have always called her our Sweet P. Next on my list to try is their lavender hair detangler spray, because Olivia's curls are so long and thick it can sometimes be a challenge to comb through them. They also have an all natural bug spray which is on my wishlist for the Summer ahead! You can use the code BLESSEDNEST for $5 off your purchase from Wash With Water at checkout if you want to give their products a try! two || I have always always wanted to put wallpaper up but was too scared to commit to something and then hate it; it was one of those things that was totally out of my comfort zone. By nature, I am not a risk taker at all but wallpaper is one of those risks that is totally harmless and fun, so I figured why not?! I was so excited to partner with Walls Need Love to showcase the most gorgeous black and white sketch floral design in Olivia's bedroom, not only because it finally made all my wallpaper dreams come true, but because it is easily removable without damaging the wall. Dustin and I put it up over the course of a weekend in two parts, we took a break mainly because Olivia needed to go to bed! ;) For the whole wall it took about 4-5 hours total start to finish and was surprisingly easy. Getting it positioned correctly was quite simple once we got the hang of it, and it has the feel more of a fabric than paper, so it doesn't crease or wrinkle and the quality isn't compromised by sticking and unsticking to get it just right. I absolutely love the feel it gives the room and was amazed that by adding a single accent wall, the entire space would be transformed. It is just the coziest place to be in, I love the unique pattern and that it catches my eye even when I'm passing her room in the hallway. 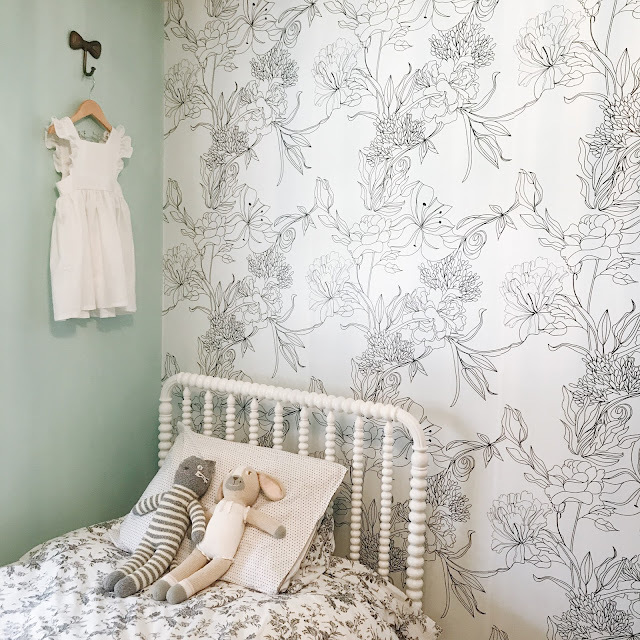 In choosing which pattern to go with, I wanted something incredibly neutral so that it would match the girls' furniture and bedding. I also knew I wanted something floral because lets face it, I love all things floral. If you're looking for a new way to revamp a space in your home, Walls Need Love is so much fun and the perfect weekend project. three || I shared these a few weeks ago in an instastory, but we just recently added a few new BlaBla Kids dolls to the girls' collection including Pepper the Cat and Pearl the Dog. Olivia and Penelope have been asking for a cat and dog for quite some time now, and for some reason I feel like having a fourth child would be easier right now than adding a pet to our family. So I figured these were the perfect compromise. BlaBla Kids offers the most darling knit dolls, pillows, mobiles & more, all handmade by artisans in Peru. four || We aim to be rooted in minimalism around here but one area we are definitely not minimal in is our blanket collection. 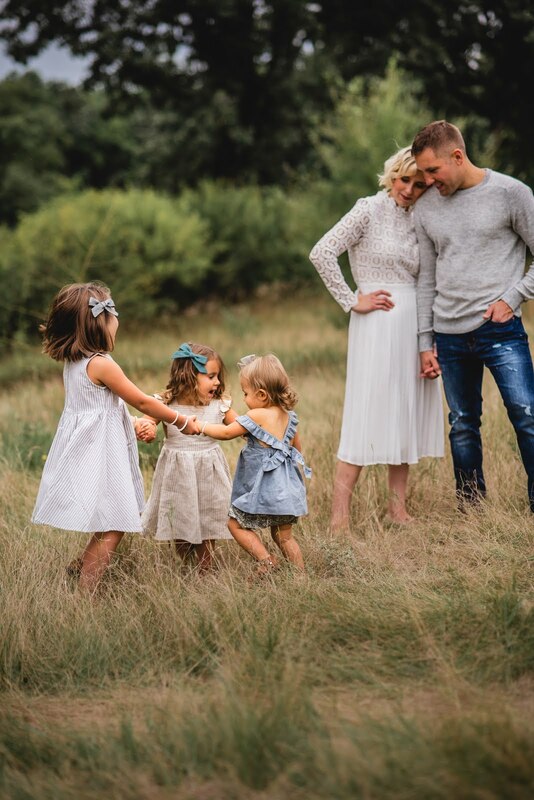 With 3 little girls and so many gorgeous options out there, I just can't say no. Between swaddles and quilts, we use them for everything under the sun so at least they're getting a lot of love and not just sitting around! Over the past 4 years since Olivia was born I've tried just about every swaddle out there and my very favorite shop for swaddles is Max and Moose, run by the sweetest Mama Alyssa. She offers swaddles in the most gorgeous, neutral colors and they are seriously the softest blankets I've ever felt. I love the look of them, the feel of them, how cozy they are, the colors she sells and especially love that they are made in the US. Each swaddle is garment dyed and put through a series of specialty washes to create the incredibly soft texture. For Spring she just released two new colors, Desert Rose & Ocean Mist. We also love her classic Camel swaddle, which we have been using since Della was born. It still has that lingering newborn scent on it, totally heavenly. You can use the code BLESSEDNEST for free priority shipping on orders over $50 from Max and Moose at checkout today through the end of May. In our backyard we have two perfect hammock trees and a few years ago we invested in one from REI and haven't looked back since. All Winter Olivia asks me when we can get the hammock back out and once it's up, it is the perfect spot for snuggling, snoozing and relaxing with my little girls. We have an ENO DoubleNest Hammock in Khaki + Black and then the ENO Atlas Hammock Suspension System, which is amazing and allows you to anchor your hammock on to any tree, anywhere. Setting it up is super simple (read: less than 5 minutes) and once Winter comes, we just take the suspension system off the trees and put it in our shed until Spring. Happy Monday! We had a really fun weekend and spent most of it outside enjoying the beautiful Spring weather. This time of year is my favorite! On Friday night Dustin and I had a couples night out with 22 of our closest friends -- 12 couples total -- for dinner at our favorite steakhouse & bowling. Dustin and I lead a married couples group in our church and also host them in our home every month so to celebrate the end of the season we all went out. I am definitely the world's worst bowler but it was such a blast, and it was the first time Dustin and I left all 3 girls at home with my parents since Adaline was born so that felt amazing to be out just the two of us! On Saturday we had a slow morning, made a big breakfast and relaxed around the house. One of my closest friends who is pregnant with her first baby (a girl!) stopped by to visit and then Dustin and I took the girls to the park. Then it was nap time and family photos. We had the most beautiful weather and did a lifestyle session at a local farm with the photographer we've had since we were engaged in 2011. It's always so much fun for me to plan the girls' outfits, accessories, and watch everything I envisioned for the session come to life. It was magical. We have another one coming up in June so I'm back at it, planning again and finalizing the details for that. On Sunday we relaxed, I spent a lot of time in the hammock with Adaline, we ran a few errands, I made my favorite quiche (recipe from this cookbook) for the week ahead and then chicken enchiladas for dinner. We had our first fire of the season, made s'mores and my Dad stopped by after a motorcycle ride to visit with the girls. My parents live just a few minutes from us and I am so grateful to be able to see them all the time and for them to be so involved in our girls' lives the way mine were growing up.